Raising a child often brings tremendous joy, but in this fallen world, it can also be a source of immense heartache and sorrow. The previous devotional demonstrated that a Christian parent must learn to find his or her satisfaction primarily in Christ. 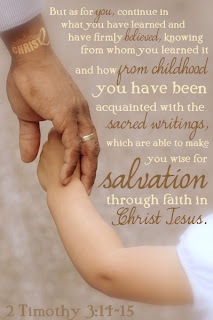 The Bible contains numerous essential principles for parents to understand when raising a child, and the goal of the Christian parent must align with God’s goal for the child. Too often, parents concentrate more on making sure that their child will succeed in this world, as defined from an earthly perspective. They want to make sure their child goes to a highly-acclaimed college so that he or she can find a good job and live comfortably. Is this how the Bible defines successful parenting? Not at all! Of course, anyone with children wants to see their child do well, but the Bible sets much higher standards for parents. Malachi 2:15 reveals that God unites a married couple as one flesh because He desires godly offspring. He wants parents to raise children that know Him, share His truth with others, and who will dwell with Him eternally. In addition to their physical needs, children are to be nourished by the Word of God (Deuteronomy 8:3). Do not simply teach them Bible stories, but teach them “the whole counsel of God” (Acts 20:27) and show them how God’s Word makes perfect sense of God’s world. Through both your words and example, help them to see that you obey the authority of Scripture in every area (2 Timothy 3:16-17). Show them that the most important thing in your life is your relationship to the Lord so that they will also make that their life’s priority. The primary goal of Christian parenting is to raise godly offspring, just as God desires. We can only accomplish this if we continually seek God’s will for our own life and the lives of our children. How Many Children Should I Have? 7 Principles Real Men Abide By.